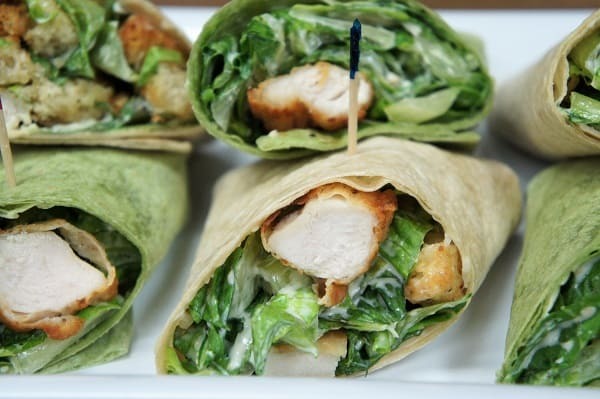 These crispy chicken Caesar salad wraps are a nice way to change up your dinner routine. 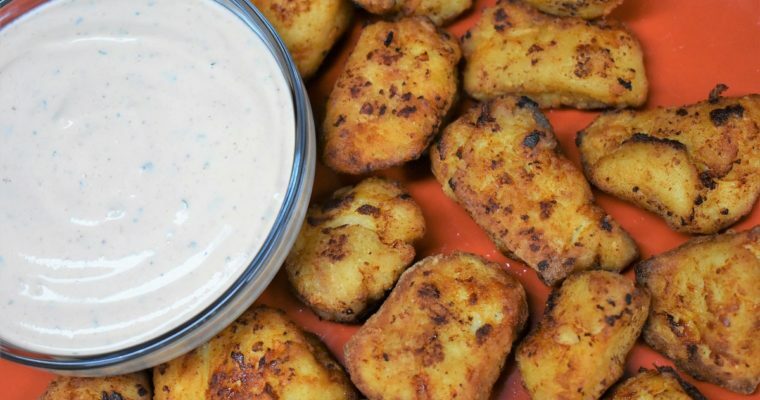 They’re also perfect for lunch, and even make a nice addition to a game-day or cocktail party appetizer table. 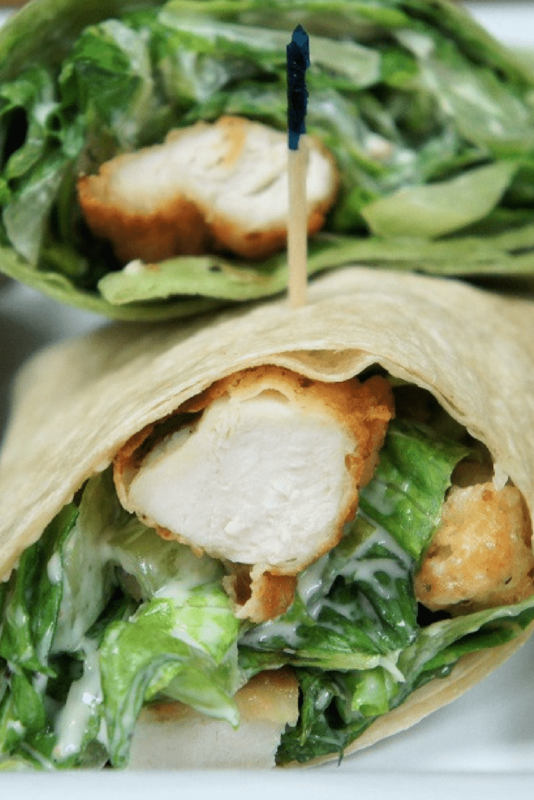 These wraps are really easy to make and super tasty, thanks to the crispy chicken strips. Enjoy! Cook’s Notes: For the chicken strips, you can use chicken tenders, but they’re quite pricey. I like using the chicken breast and cutting them into strips instead. Butterfly the chicken breast, then go all the way through. You’ll end up with two equal pieces. Cut each piece in half, lengthwise to make two strips. One chicken breast will yield four strips. Repeat with the remaining breast. In a small bowl, combine the salt, garlic powder, onion powder and black pepper. Stir to combine well, set aside. Season the chicken strips on both sides with a little less than half the prepared seasoning mix. Reserve the remaining seasoning mix for the flour. Add the flour to a shallow pan or plate, add the remaining seasoning mix, and stir with a fork to combine, set aside. Pour the milk in a medium bowl and set aside. Lightly coat the each chicken piece with the seasoned flour. Shake off excess. Then dip the coated chicken piece into the milk bowl, making sure the entire piece is moist. Place the chicken back in the seasoned flour mix, ensure the chicken is completely coated, shake off excess. Set the chicken on a pan or plate lined with parchment paper and repeat with the remaining pieces. Discard any leftover flour and milk. Pour enough oil in a large, heavy skillet to cover the entire bottom by about a ¼ inch. Heat the canola oil over medium-high heat. Make sure the oil is hot before adding the chicken. I like to use a test piece to make sure the oil is hot enough. If the oil starts bubbling and makes a sizzle sound, it’s ready to go. Also, be sure the oil is not too hot or the coating will brown too quickly and the chicken will not get cooked all the way through. Add about half of the chicken strips to the skillet. Don’t overcrowd the pan, fry the chicken in batches. Use tongs to turn the chicken so the coating doesn’t flake off. Fry the chicken strips for about 3 minutes per side until golden brown. If the chicken is browning too quickly, lower the heat a little bit and turn the chicken strips frequently to brown evenly on both sides. Remove the chicken strips from the skillet and place them on a baking sheet, lined with a cooling rack. Sprinkle the chicken strips with a pinch of salt, if desired and place them in the oven while you cook the remaining pieces. Fry the remaining chicken pieces. Note: If may be necessary to lower the heat a little bit for the second batch. Once the chicken strips are frying make sure they are sizzling and the oil is bubbling, raise the heat a little bit again if necessary. Make sure the internal temperature of the chicken strips reach at least 165°F at the thickest part. 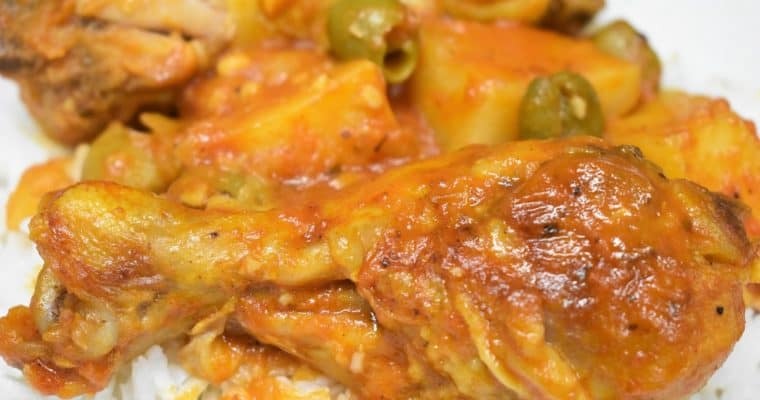 When the chicken has cooled enough to handle, chop each strip into bite size pieces. Add the chopped romaine lettuce to a large bowl. Next, add the Caesar dressing, and stir until the lettuce is coated. Try not to over-dress the salad so the lettuce doesn’t get soggy. Remember you can always serve the wraps with extra dressing on the side. Add the croutons and Parmesan cheese to the lettuce, toss well to combine. Place the wrap on a flat surface, add a generous amount of the Caesar salad and top with chopped chicken. Fold the two sides over, then fold the side closest to you over and begin to roll, keeping the salad in the wrap and roll tight. Place the seam down so the wrap stays put. Repeat with the remaining ingredients. Enjoy!